The University of Warwick have launched an investigation after a student tweeted a photo of racist slurs someone had written onto her bananas in marker pen in her halls of residence. 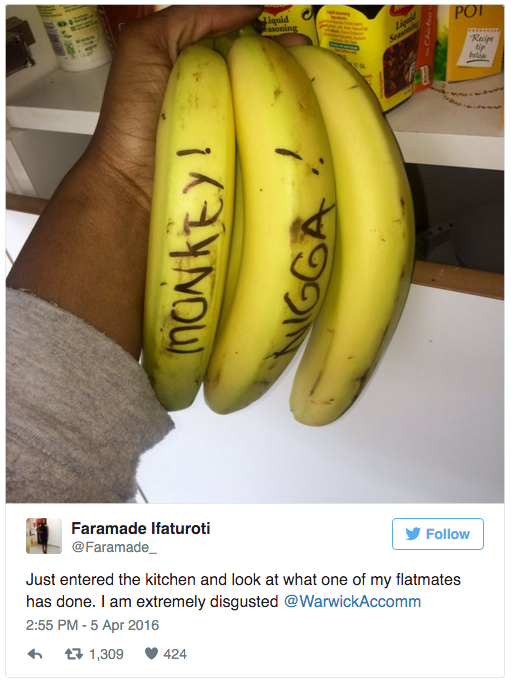 Faramade Ifaturoti posted a picture of the racist slurs to her twitter page, which she believes was done by one of her flatmates. A Warwick spokesperson told HuffPost UK that this had been escalated instantly, and that “The head of accommodation is personally investigating this complaint." However Faramade is disappointed that it took this long, and the attention the tweet has received to get the University to respond to the complaint. "The Sabbatical Officer team has just been made aware of the appalling images currently being circulated online which depict an instance of racism in a campus accommodation block. "Warwick SU has a zero-tolerance policy on racist behaviour. We unequivocally condemn this shocking and disgusting act, which should clearly have no place in either our University or society at large." "We have reached out to the student affected by this episode and have contacted the University to offer further support. Should a formal complaint be raised regarding a specific individual's conduct, the SU will of course treat it as a matter for urgent disciplinary action." They also tweeted, calling the incident a "vile racist attack"
I'm shocked, disgusted, and saddened at such a vile racist attack on a Warwick student. The SU is taking this matter incredibly seriously. Racism is very real. Especially in this Warwick I can't lie. She is understandably extremely upset by the incident, expressing her shock that things like this still happen today. I'm actually fuming! Like what?In 2016? People still behave like this?! The University are currently investigating the incident, which has taken place during the University's Easter Holiday.